It’s a great time to be a big brand. Big brands have nothing to worry about when it comes to search. They have it all; top page ranks, multiple links; Google are even currently testing overlarge banner ads for big companies in its search results. Big brands will be fine. Google was specifically designed to support big brands, filtering out the flotsam and jetsom of the internet and providing users with ‘trusted’ big name brands they recognised and pushing the more dubious websites further down its SERPS. Agility – Your business is small, you can do things off the cuff without having to get multiple directors to sign-off on an experimental piece of marketing or trial of a new social media channel. Passion for your own product – You wouldn’t be doing this if you didn’t have a huge passion and belief in your own product. You’re the heart and soul of your company, so put that at the centre. How many middle-managers working at Coca-Cola right now are thinking to themselves “I bloody love cola”. Your team – It’s highly likely that as a small business your team consists of you and your friends, or you and your family, or you and some colleagues who have become as close as friends or family. These people aren’t siloed away in another building with a different mindset to yours. They are multi-tasking, multi-disciplined advocates who are as heavily invested (financially, emotionally or both) as you are. Use this close-knit association to do great things. Hawksmoor’s founder Will Beckett went from opening a small restaurant in Shoreditch in 2003 to now running the fifth best company to work for, according to the Sunday Times, only a decade later. There are currently five restaurants to the Hawksmoor name. Start-ups fail because they are not good at what they do. It’s a simple fact, especially in the restaurant trade which has more reliance on word of mouth than most businesses. If someone has a good meal they’ll tell a few close friends, if someone has a bad meal or terrible service, they’ll tell everyone. Will Beckett maintains that the fine dining experience is one of the few businesses or services that Google can’t replicate online. Increasingly anything information based can be read on Google’s own SERP without even the need to click through to a website. 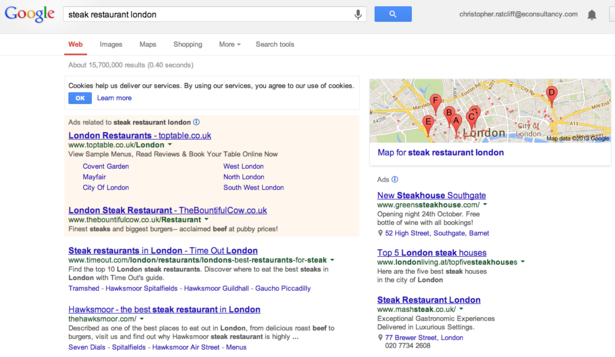 If you want a delicious steak in a good looking restaurant with great service, Google will never be able to do that for you. Well, not without a massive overhaul of their business strategy at least. 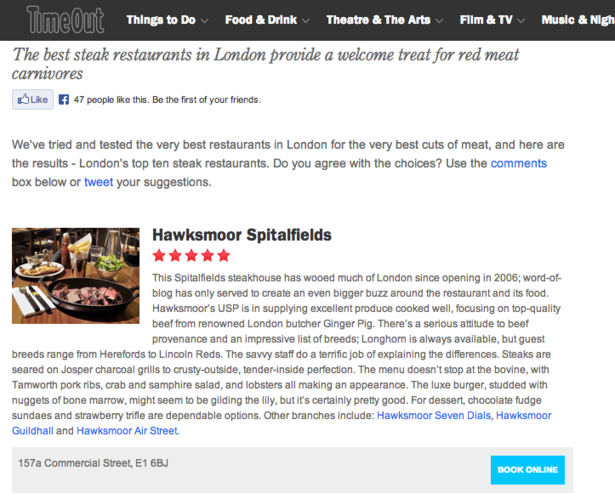 Hawksmoor invites bloggers to come have a steak. By using the very thing that makes you noteworthy in the offline world, you can easily capture online attention. 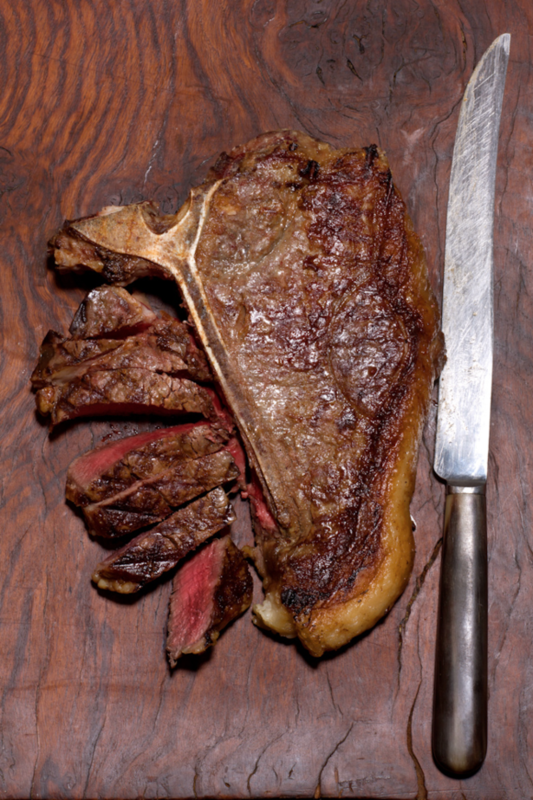 Whenever Hawksmoor open a new restaurant, it sends an employee to go round every local business and invites them over for a steak, or to specific events. Making these local links will build a strong community and good base of support, and is also key in spreading positive word of mouth. Run your own Twitter page. Will Beckett still runs Hawksmoor’s Twitter, which is essentially an effective customer service channel for it. Hawksmoor doesn’t pay for expensive tools to measure engagement, it just listens to people and chats to them. Allow constant access to people, either through social media or with live chat on your own website. The benefits of live chat are explained here. Chances are that the person using your chat function is a little confused about something on your website. Engage with them directly right there and then, and they’ll probably spend their money with you. Show off your product in the best possible, highest quality way online.